Should you let LeadPages host your content? 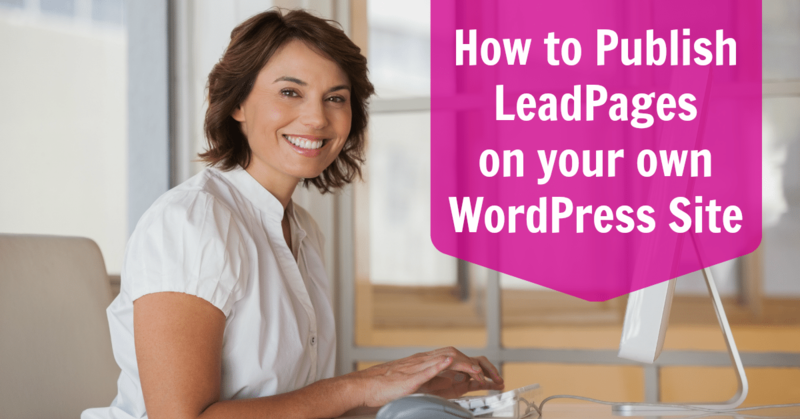 I'm also going to give you a quick tutorial on how to install the LeadPages WordPress plugin on your site, and how to publish a page, in case that's the route you decide to go. To quickly sum up in layman's terms, in case you don't have time for the article, LeadPages explains that because they use the Google server network they are able to serve your pages super fast. These faster load times help conversion rates, and in the example given, conversion rates have been seen to go up by 10% in split testing thanks to these faster load times. So that's a great advantage, not to mention that it's super easy to let them host the pages for you! What I've been hearing recently, however, is there is a potential issue with letting LeadPages host for you, because they appear to be flagged by a site called the Web of Trust. I've never had an issue, nor have my clients, with sending traffic to Leadpages.net, but the following can be found in the Facebook Help section…. Ads may not lead to destination pages that have been flagged as having a bad reputation by Web of Trust. Web of Trust is a 3rd party website review service and has no affiliation with Facebook. 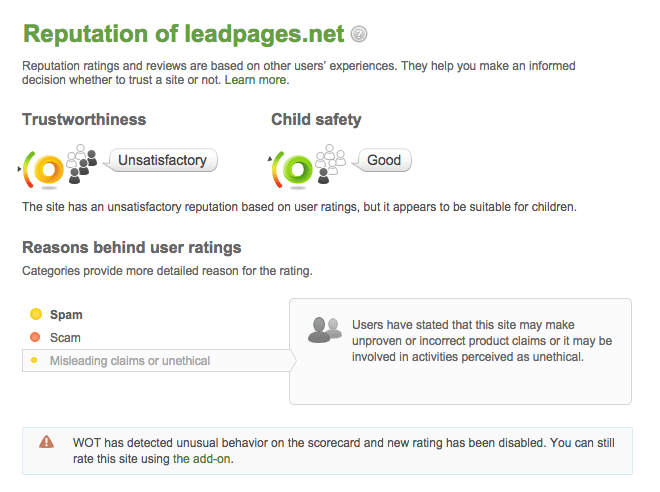 To find out more about your rating and how to influence your site's reputation, please visit: http://www.mywot.com/. So, I have to say, I am a little conflicted as to what I will do moving forward! I am sure that LeadPages is all over this, and I have never had any issues. I also love that the pages load quickly, which can help with conversion rates. However, I can also see how Facebook would prefer to send ad traffic to a URL that isn't getting tons of traffic already – another issue I've heard brought up since leadpages.net is in the URL and thousands of people use them for hosting. The WOT score is still low as of today, and also might be an issue, as I discussed above. So….what to do? What to do? If you decide you do want to host your pages on your WordPress site, it is very simple to do if you follow these steps. 1. When you are in LeadPages, click on the LeadPages icon at the top of your screen. You will get a pop-up box like the one below. 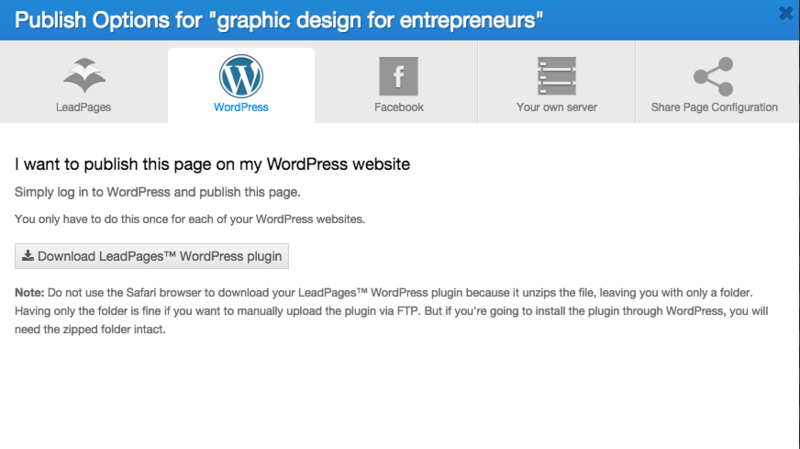 Click the WordPress icon at the top, and then click the “Download LeadPages WordPress plugin” button. 3. After the zip file downloads, (do NOT unzip it, and do NOT use Safari to download the file – see their note above), log into your WordPress site. Click on Click on Choose File, find the Zip file you downloaded, then click the Install Now button in the center of your screen. 4. The plugin will get uploaded, and then you click on Activate Plugin. LeadPages should now be listed in that menu on the left somewhere. 5. Click on LeadPages from the menu area on the left in WordPress, and click Add New right below that, or at the top of the screen. Now all you have to do is choose Normal Page, and find the page you want to publish where it says LeadPage to display (that you've already created in LeadPages), in the drop-down menu. To create a custom URL for the page, just type in the box provided. 6. Hit the big, blue Publish button, and then a link will appear at the top of the screen that says View Page so you can go see your page! That's it! NOTE: The page itself is still created over onLeadPages.net in your account, all this does is host the page on your own website and removes the leadpages.net from the URL. I hope this was helpful! Let me know – have you ever had issues with LeadPages hosting or is this just a whole lot of rumors floating around? As I said, I've never had issues myself, so I would love to hear your experiences! Hi Julie, this is a great article, thank you! What would you say are the pros/cons to uploading your lead page directly to your own site vs. using the WordPress plug-in? I am beginning to build my list with an opt-in I created and I can’t decide which route to go. Thanks! I’m glad it helped! You can do it either way, but the “pro” to using something like LeadPages is that the page is built for conversions. Meaning that LeadPages has done a lot of testing to make sure the pages convert well into leads. Also, when you have a “stand alone” type page like this, that doesn’t include any navigation or sidebars and footers etc, there’s less to distract the user. They either sign up or go away, and that’s a good thing, because conversions are almost always higher when you force them into this choice (lots of testing to back this in the industry). Otherwise, they can get distracted by a link to your blog or services page etc and wander off. 🙂 Hope that helps! Hello, thank you for the info on Leadpages, but I’m a bit confused. So using the WordPress plugin will not allow a custom landing page without the WP elements of the site theme? Our client would like to have a standalone page like you describe (without the nav, sidebar, footers, etc), easy to build, and appear publicly to be hosted on their domain. Regards! I have lead pages and am wondering if it is worth the ongoing cost. Do you know, if I stop my subscription, will my self-hosted pages (generated through leadpages and hosted on my website, not at leadpages) still work? If you stop your LeadPages account, since the pages are created there, even if you host on your site, they would stop working. As to whether or not it is worth the cost – I would look at it this way: How important is list building for you? Is it a high priority and you are going to be creating a lot of opt-ins and sales pages and need a quick and easy way to do it without paying a designer or coder? If so, then I would get LP – or something comparable. If you have one opt-in you want to do and list building isn’t a big focus, at least not yet, then I’d start with one of the free options. There are some good alternatives that are less expensive if you’re not ready for the investment too. Personally, I like the ease of use with LP and that I’m able to easily add tracking for my FB ads + host on my own website.